Meet the heaviest tungsten necklace ever made. 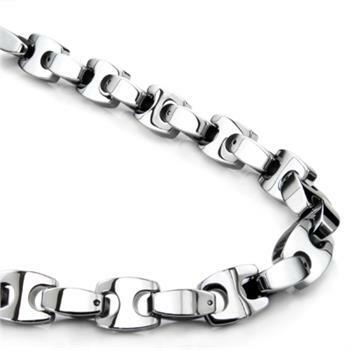 This chunky necklace features solid tungsten carbide links finish to the highest gloss mirror finish. You can see it sparkle even from a distance. Inspired by the classic Italian Marina link style, the design gives a 3D twist by connecting links at a 90 degree to the next one, it definitely look much more dramatic than the flat Marina link necklace counterpart. As with all our tungsten necklaces, this necklace has our specially designed pins to hold the links together. It also has a heavy duty lobster clasp for closure, and the entire necklace is designed to have the highest durability. Our nickel bound tungsten carbide is 100% scratch proof and tarnish proof. Every inch of this necklace weighs approximately 12.5 grams, e.g. a 24" necklace weighs 300 grams.